Slight warning folks, our dessert recipe in this week’s tips, tipples & table talk is sure to have your mouth watering so reader discretion (during work hours or you know, on a public bus…) is advised! We’ve also got some Bavarian beverages you might like to enjoy during Oktoberfest Dublin and we discuss what makes farming in the Burren, Co. Clare so very special. In excitement of Oktoberfest arriving to George’s Dock (Dublin 1) this Thursday 18th, we’re getting our Bavarian dirndl dress and lederhosen together, and planning which German tipples we’ll be enjoying this week (and no, not all at the same time). 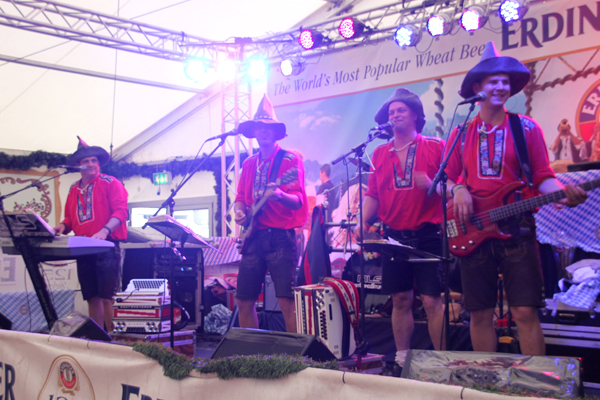 Erdinger Weissbier – From one of the world’s largest wheat beer breweries and the official sponsor of this year’s Oktoberfest Dublin, is one of the most famous weissbiers. While it is fruity, what we enjoy is that it isn’t too sweet either. Light and easily drinkable, this is a great thirst quenching beer. Paulaner Hefe-Weissbier – A well balanced wheat beer, you can certainly taste the yeast and banana, without it being too overpowering. Quite sweet which compliments the light bitterness, this medium bodied Weizen is fresh and flavoursome. Krombacher Pils– This German Pilsner has nearly an all grain flavour with a minimal hop taste. This is a crisp and light bodied beer, best enjoyed on a warmer Autumn’s day. Brewed with natural spring water, this provides its refreshing taste. Wagner Stempel Spätburgunder – A German Pinot Noir, from the Wagner-Stempel winery encapsulates all that is great about Pinot as a variety, and Germany as a wine producer. This softly perfumed wine is delicate but beautifully flavoured, with raspberry, cherry and redcurrant flavours. Pop in and enjoy ely bar & brasserie, IFSC, Dublin 1, when visiting Oktoberfest Dublin. As the days get cooler, we step away from lighter desserts and enjoy heartwarming indulgent classics. These gorgeous brownies are heavenly served with ice-cream and also ideal for storing as treats for your coffee break – if you can resist them for that long! Line a baking tray, measuring approx 38 x 26cm, with greaseproof paper, or lightly grease a glass ovenproof dish. A lasagne dish is ideal. The tray or dish should be 2cm minimum in depth. Combine the sugar, butter, cocoa, ground coffee and salt in a metal or heatproof bowl. Place the bowl over a saucepan of simmering water and leave until the butter melts, stirring occasionally to help blend the ingredients – the texture will be grainy. Remove the bowl from the water and allow the mixture to cool to lukewarm. Sieve the flour over and fold in. Take three-quarters of the pecan halves and roll up inside a clean tea towel. Bash lightly with a rolling pin to break up. Stir the pieces into the mix. Pour the freshly brewed coffee over the mixture with the chocolate and stir until melted and smooth. Pour the mixture into the prepared dish or tray and spread evenly. Allow to cool and thicken for approximately 1 hour. Preheat the oven to 180°C. Bake in the oven for 25 minutes or until a skewer inserted into the brownies comes out clean. Remove from the oven and cut into squares. 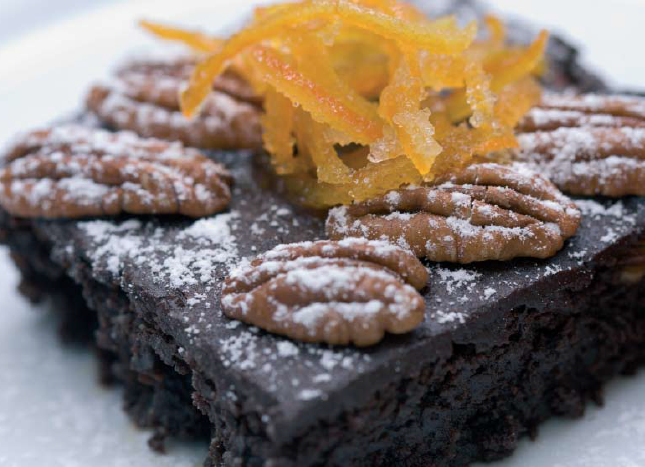 Dress the brownies with the reserved pecans and ginger or candied orange peel. Dust with icing sugar. Serve warm with vanilla ice-cream. Or, let us do the work for you! Homemade desserts by ely’s executive pastry chef available at ely wine bar, 22 Ely Place. Table Talk of the Week: What Makes Farming in The Burren So Special? For those of you who aren’t aware, the ely organic family farm is located in the Burren, Co. Clare (refresher here). Often people have asked us why we have chosen to keep our farm there and what makes farming in the Burren so special. The beauty of farming in the Burren, Co. Clare lies in the fact that it has been farmed in the same fashion for 6,000 – 7,000 years. This way of farming, where your animals are up on the hills in the winter months, is unique only to the Burren, Co. Clare. Due to its limestone structure, the Burren landscape acts almost as a storage heater. The land receives heat from the Atlantic drift in the summer and it stores that heat for the winter as the soil depths are so shallow. Gentle heat releases from the limestone all winter making for very little frost, and allowing the animals to be happier and warmer on the hill (also called the winterage) than in the valley. The animals then come down to the valley for the spring and summer months. Also unique to the Burren is the way in which land is distributed. Land in The Burren is sold, not by the area, but by the numbers of animals you keep or feed. Summer land is matched with the winter land and you always have enough winter land to maintain the animals you keep on the summer land. Many of the cattle farmers in the Burren might produce calves in the spring, feed them on the rich pastures of the valley in the summer, sell the calves in the autumn and put the cattle back up on the winterage in the winter. Life in the Burren always works as a balance. 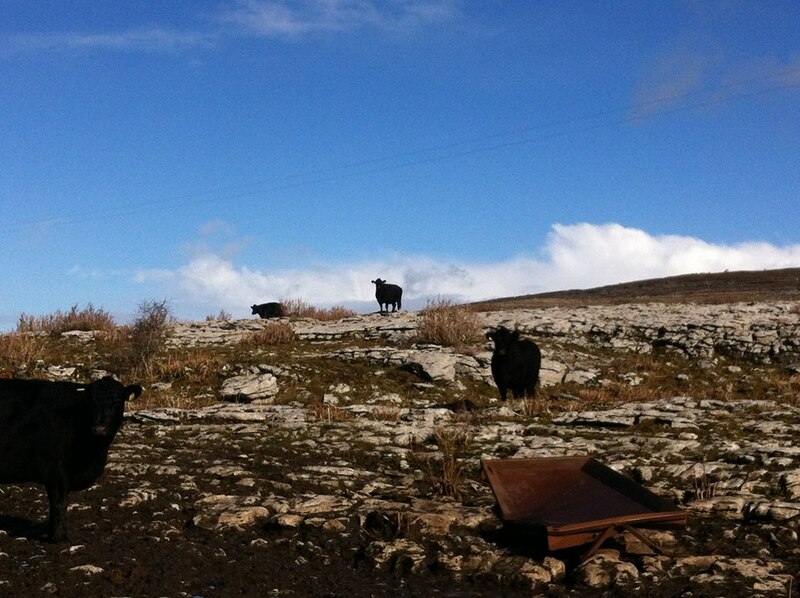 We source all of our grass fed beef, pork and lamb through our organic family farm in The Burren, Co. Clare.